Pollution prevention is what happens from an effort that reduces the amount of pollution generated by a process, whether it is consumer consumption, driving, or industrial production to a level so low it is deemed to be not worthy of concern. In contrast to most pollution control strategies, which seek to manage a pollutant after it is formed and reduce its impact upon the environment, the pollution prevention approach seeks to increase the efficiency of a process, thereby reducing the amount of pollution generated at its source. Although there is wide agreement that source reduction is the preferred strategy, some professionals also use the term pollution prevention to include pollution reduction. With the increasing human population, pollution has become a great concern. Pollution from human activities is a problem that does not have to be inevitable. With a comprehensive pollution prevention programme, most pollution can be reduced, reused or prevented. One of the pollutants is the misuse or improper handling of pesticide. The major source of pesticides in urban streams is home applications of products designed to kill insects and weeds in lawns and gardens. Pesticide pollution prevention programmes try to limit the adverse impacts of insecticides and herbicides by providing information on alternative pest control techniques other than chemicals or explaining how to determine the correct dosages needed to manage pests. Lawn care and landscaping management programmes often include pesticide use management as part of their outreach message. Many alternatives are available to reduce the effects pesticides have on the environment. Alternatives include manual removal, applying heat, covering weeds with plastic, placing traps and lures, removing pest breeding sites, maintaining healthy soils that breed healthy, more resistant plants, cropping native species that are naturally more resistant to native pests and supporting biocontrol agents such as birds and other pest predators. Biological controls such as resistant plant varieties and the use of pheromones have been successful and at times permanently resolve a pest problem. Integrated Pest Management (IPM) employs chemical use only when other alternatives are ineffective. IPM causes less harm to humans and the environment. The focus is broader than on a specific pest, considering a range of pest control alternatives. IPM is a term used to describe a systematic method of managing pests using non-chemical pest management methods and the judicious use of pesticides when pest populations exceed acceptable levels. When pesticide applications are necessary, priority is given to using the least toxic pesticide as first choice. The implementation of integrated pest management is recommended as a common sense approach to pest control in all environments from residential to municipal, commercial and campus settings for both interior and exterior applications. Significant reductions in the volumes and toxicity of pesticides applied can be achieved when an IPM programme has been implemented properly. The reductions result from the elimination of scheduled pesticide applications that are often used as preventive treatments. Precision applications of low toxicity pesticides rather than typical baseboard applications or treatment of an entire property also have proven to greatly reduce the total volumes of pesticides applied. Homeowners can suggest to their service providers to use IPM programmes when they are conducting pest management within their home or landscape. The key to successful pest management for homeowners is good communication and a commitment to change conditions that make it easier for pests to flourish. Generally, it is not necessary for a home IPM programme to be complex in order to be successful. In municipal, commercial and campus settings, development of a written IPM plan to establish individual responsibilities, pest action thresholds, a system of communication and pesticide hierarchy is recommended and, in some cases, required by law. Government regulatory agencies and consumers alike favour the Integrated Pest Management or IPM paradigm adopted by Masa because of its reduced risk to non-target organisms, minimal intrusiveness and improved long-term results. Integrated pest management combines intelligent decision-making with a variety of preventive and corrective measures to reduce pests. IPM does not rely exclusively on the use of conventional insecticide sprays. • Inspect and interview to determine the source and harborage of pests. • Identify the pest species to decide the appropriate course of action. • Establish cooperation of customers and residents to ensure optimal results of IPM. • Avoid bringing pest-infested items such as used furniture and appliances, electronic entertainment systems and boxed produce from questionable sources, into the area. • Enhance bait acceptance by removing the pests’ source of food. • Remove food waste and empty beverage containers daily. • Remove as many pests as possible through trapping using food lure sticky traps, vacuuming using a high efficiency particulate air (HEPA) filter vacuum cleaner. • Use insecticides with ability to target the insect’s physiology without posing a threat to people, companion animals or beneficial wildlife. • Strategically place insecticide baits that cause nearby pests to feed and die. • Administer insect growth regulators (IGR) to interfere with the pest’s ability to mature and reproduce. • Seal-off cracks and crevices repeatedly used by pests for harbourage. • Monitor over time using baited sticky monitors, pheromone traps, insect light traps. • Inspect and interview to determine if the pest situation is improving. • Adjust IPM methods as necessary. The IPM programme that Masa implements is perfect for sensitive environments. It uses all available measures to control pests according to their nature and the location to be treated, with a focus on non-toxic methods of control. Clear instructions are given to a client on preventive sanitation measures, on the best ways to store food and dispose of rubbish, as this helps to reduce the harbourage areas and limit food sources for pests inside the premises. 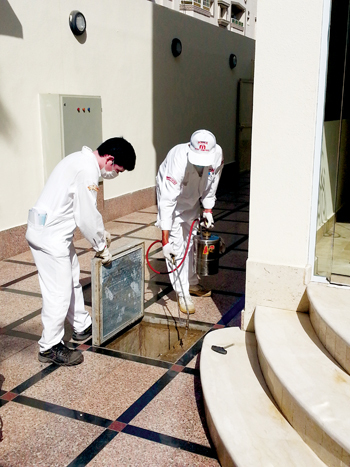 Masa has been protecting hotels, luxury villas, palaces, hospitals, schools, residential and other commercial properties against pests for over 35 years now. Its staff are trained, certified and insured for this particular kind of work. A member of 13 international pest control associations, Masa establishment exerts every effort to boost public awareness of the pest hazards on premises and urges the public to cooperate with a professional pest control operator to maintain a healthy environment.